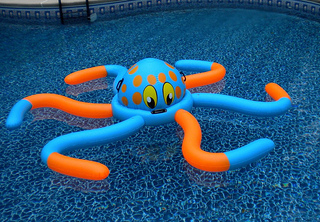 We use inflatable pool toys for fun pool party decorations like this octopus for our Under the Sea Party and for fun pool party games. Who can have a pool without inflatable pool toys? These are often the most available, least expensive, and entertaining of all pool toys. The kids loved this lizard float that we bought for our Jungle Pool Party. Three kids (5 and under) would get on at a time and my husband would take them for a "ride" around the pool. They loved trying to stay on or tipping the lizard over. 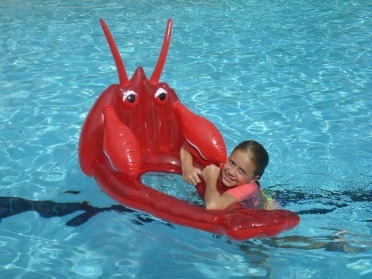 Our lobster friend can be used as a fun pool float or toy for an afternoon of lounging or playing with friends. 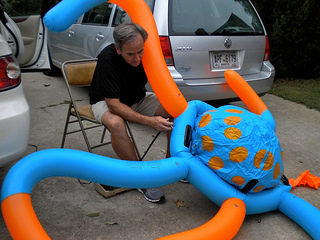 No one will have trouble finding this ride on 50" inflatable pool toy with grab handles for extra stability. Any child who is in love with Nemo will love to share the seas with him all summer long. Nemo needs his friend Dory for summer fun explorations in your pool. These inflatable dolphins with squirt guns joined our pool this summer and have never left. Fun for all ages as floats or for friendly squirt gun skirmishes. Be sure you get two for a proper water fight. For your pool parties, have a swimming pool float that matches the pool party theme. Shark floats for a shark party make for a great decoration floating in the pool when the guests arrive and provide lots of opportunity for pool party games. Small kids may have trouble staying on this float, but others have found this pool float to be great fun using two of them for pool races. 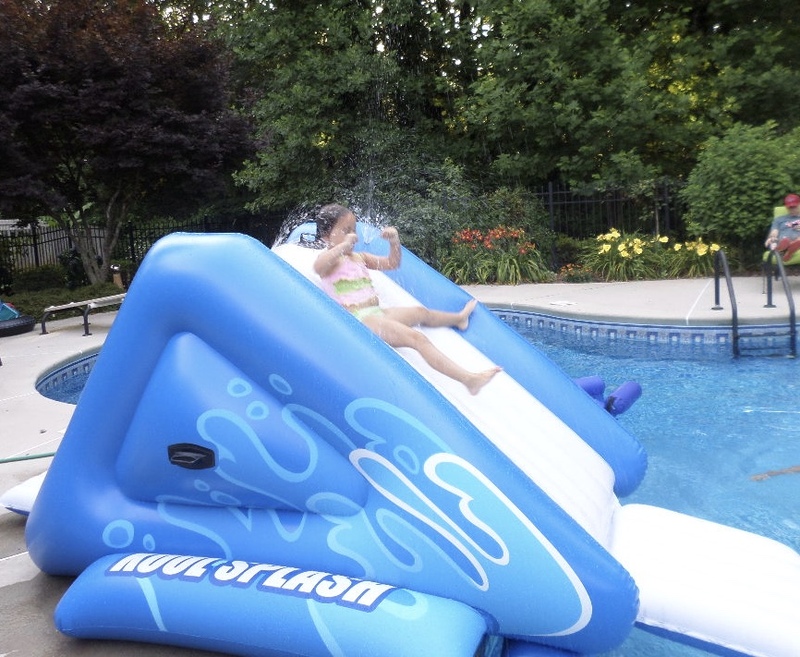 Inflatable swimming pool slides can add new excitement to your pool. Our neighbors spent a couple of thousand dollars for a permanent pool slide when really for under a $100 you can get one that will entertain kids just as well. These are meant for kids - not adults or teens. The steps are build into the slide and stabilizers are added to the sides to keep it from tipping. As of May 2013 Intex has upgraded the thickness of the vinyl so it is less apt to tear. We have had ours all summer with lots of different kids enjoying "the ride" down. We've never had to re-inflate it. Now .... what to do with it when summer is over. This one measures 119" x 81" x 53". Why not make your next pool party a themed party like How to Train a Dragon? It's a great pool party idea that appeals to boys and girls. 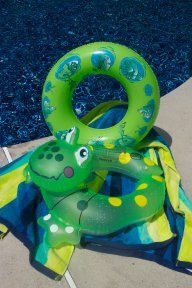 Decorate your pool with this dragon float and then use it for lots of pool fun and games. We keep a portable air pump out be the pool for all of our pool inflatables. You can get one with or without the need for batteries. 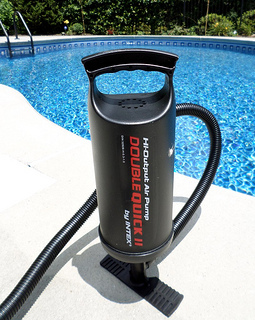 The Double Quick II Air Pump is a hand pump that actually pumps air as you push down and bring it back up. It includes three nozzles that are different sizes to fit just about any pool float, swim ring, or inflatable toy. Just push down on the handle and pull up and you will find that it fills any inflatable really fast and really easy. Never blow up a swim float again! If you want something else to do all the work for you and do it quickly, then get a battery operated air pump. Not only is this one battery operated, but the batteries are rechargeable so you don't have to keep buying new ones. However, it is important to keep the batteries charged, even when not in use. Made by a company that knows about outdoors, Coleman is a well respected, long time company known for their great outdoor products. Weighing just under 4 lbs it can be easily taken to the pool or beach. No more squeezing air out because this pump has a reverse air flow. It will deflate your inflatable pool toys so that they can be stored easily for the winter. Be aware that it is noisy , so you may not want to be inflating a float at 7 in the morning or 10 o'clock at night. What most people like about this air pump is that it is fast - much faster than our hand pump or air compressor. I don't need to see my husband's steely eyes any more when I ask him to inflate a new pool toy. Thanks to the pool steps none of them had any trouble getting on the aqua rocker. At first it was a challenge to stay on it and soon they were able to stabilize them selves. But they had a ton of fun trying. You need to be sure that they are away from the sides of the pool so no one gets hurt falling off. This pool toy's dimensions are 56" long, 30" wide and 18" high. We used a hand pump to inflate it - don't over inflate it. Try under-inflating a little for easier use. Even though he doesn't way a ton, you can still have a ton of fun with this whale pool toy. Measuring 63" x 60" there is nothing small about this sea creature. Two grab handles make it easy to ride on. Sturdy and stable are two words to describe this fun pool toy. 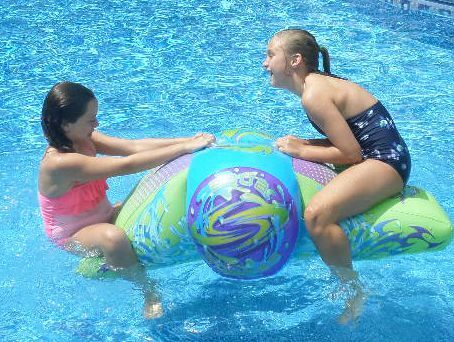 Blue Whale Ride-On, 60" X 63"
Looking for a pool float that doesn't tip? This huge sea turtle is perfect for almost all ages. Made by Intex, known for their quality products, this fun pool float will provide lasting fun. It's too big for an above ground pool - at 6'3" x 5'7" - it is a great float that can accommodate two kids or one fun loving adult. 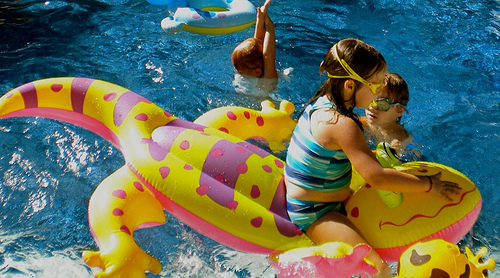 Inflatable swim rings can entice almost any child into the pool - whether it's a frog, a monkey or zebra. They appeal to boys and girls, are easy to put on and get off (buy the split kind) and allow kids to float tirelessly for long periods of time. Kids wearing inflatable rings need constant adult supervision - children should never be left unattended wearing one of these! 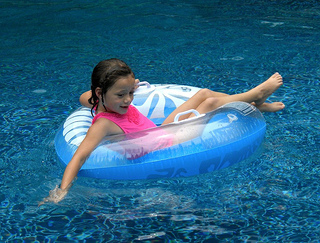 Use swim rings for pool games or to decorate for a pool party. You can find these floats at Target, K-Mart or the grocery store in the summer or on line at Amazon year round. 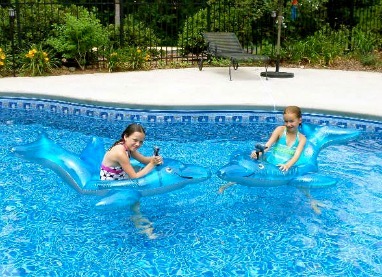 Because they are so inexpensive, we always have several of these pool floats to match the latest interest of our grandkids - whether it is a monkey, frog, hippo, dolphin or shark. Get a swim ring to not only match the age and gender of your child - but get floats that match up with your themed pool party. Like a shark one for a shark pool party. Get an extra one to hang on the pool gate as a party decoration. Larger swim rings - 30" to 36" work great for all ages - kids, teens and adults. Everyone simply gravitates to them. They are great for just relaxing and talking with a friend or for pool races. Inflatable pool toys are fun and entertaining for all ages - kids and adults can have fun floating on them or for using them for themed pool party games and decorations.